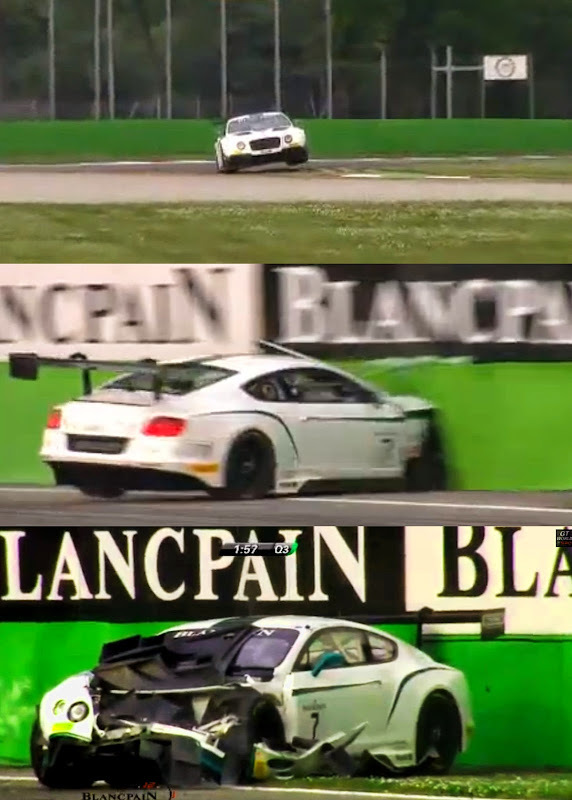 Flying Bentley Continental GT3 Spurs into Wall. See what I've done there? And on his last and fastest lap of the session, #Car7 loses control at the Ascari chicane and hits the wall. @TheStevenKane is OK. It's cosmetic only so will hopefully be fixed. That means car #Car7 will line up P4 on tomorrow's grid, with @TheStevenKane's 1.48.322. A great starting place for our first race. Meanwhile, @duncantappy's 1.48.612, only 0.3 secs slower, means P13 for #Car8. 38 cars will start tomorrow's race. So Bentley line up at positions 4 and 13 tomorrow, with only 0.3sec between the cars.